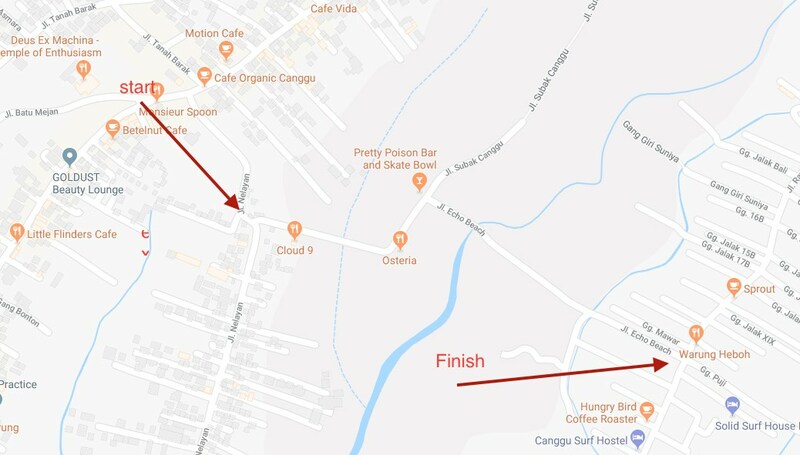 This is the best shortcut to get from Canggu to Seminyak in Bali without huge traffic jams or waiting at intersections; it’s the Canggu to Seminyak shortcut. For those that know about it, it’s a lifesaver and is really the most popular way to get between the 2 areas. Canggu & Seminyak are the two most popular tourist destinations in Bali and as you can imagine the traffic between the 2 areas is basically horrific. If your holidaying in one of our Seminyak villas and want to spend the day in Canggu you either have to leave really early in the morning to avoid the traffic or you can expect to be stuck somewhere along Jalan Raya Canggu for unto 60 minutes. This is the reality of driving a car in Bali and this is the sad truth for many travellers who are coming to Bali with their family or in a group and want to do some sightseeing. The traffic in a word is: ‘terrible’. The truth of the matter is that it doesn’t look like its going to get any bettering the short time so shortcuts like the one in the video are an essential passageway, thoroughfare or artery in getting around the place. Thi sis just one of the hundreds of shortcuts dotted all over the island, but if you ask anyone which is the shortcut they use mostly and 9 out of 10 people will talk about this famous shortcut through the rice fields between Canggu and Seminyak. Finding it can be a bit hard if your a newbie to Bali and don’t really know the roads that well but once you get your bearings you will soon realise that this shortcut is a lifesaver. It knocks about 30 -45 minutes off your travel times between the 2 destinations. You have to make you way to the Finns Recreation Club and it’s about 100 metres on the left hand side as you head north. Just look for the small intersection with all the scooters, taxis, trucks and mini vans queuing up here and you know you’ve arrived at the sweet spot. The shortcut itself takes about 5 minutes to drive through, again depending on the traffic & the number of vehicles it can take up to 15 minutes during peak periods. It’s actually controlled chaos as the ‘so called’ road is no larger than the width of 1 large car. Just imagine the scene if there are 2 cars on it at the same time driving in opposite directions. It’s mayhem as one driver has to reverse all the way back to let the other through. In the interim all the traffic is constantly building up waiting to get through. It can get polluted, noisy and drivers can loose their temper. But with all it’s pit falls it’s still a lot quicker than taking the main road. One thing to note as well is the number of novice drivers who try to navigate this for the first time. Many of these make the mistake of misjudging then coming cars and drive over the 1 metre edge to the rice fields on the side. This is a daily occurrence and many novices get seriously injured as they try to wedge them selves through the on coming traffic. I know all of this sounds horrible but believe us when we tell you once you get the hang of it and make the journey a couple of time, you will find that the Canggu to Seminyak shortcut becomes your best ally in this road clogged southern part of Bali. It starts at the beginning of Jalan Nelayan and end where you see the Warung Heboh – just keep following the traffic and you will end up there. You actually don’t end up at Seminyak but in Batu Belig area. Seminyak is only 5 minutes from here but you can take the road which is fairly uncrowded. Tyrn left at the end of the short cut and keep on going. If you get lost pull over and ask a local for directions.